Pro versions of report will be available immediately after report purchasing. Brief descriptions of the codecs used in our comparison are given in Table 2. 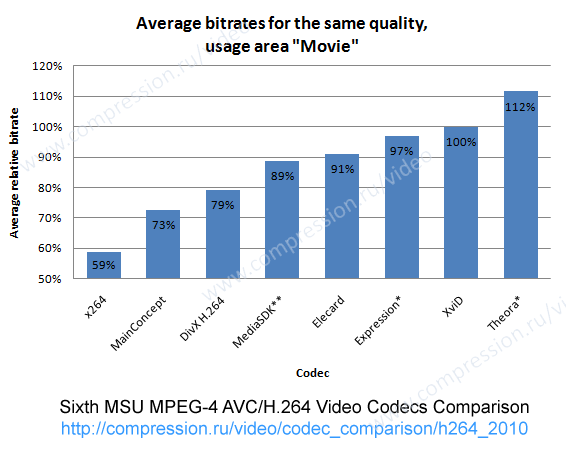 XviD was used as a good quality MPEG-4 ASP reference codec for comparison purposes. Detailed descriptions of all codecs used in our comparison can be found in Appendix 5. Tested Codecs and Presets. to test and analyze its codec. The main goal of this report is the presentation of a comparative evaluation of the quality of new H.264 codecs using objective measures of assessment. The comparison was done using settings provided by the developers of each codec. The main task of the comparison is to analyze different H.264 encoders for the task of transcoding video—e.g., compressing video for personal use. Speed requirements are given for a sufficiently fast PC; fast presets are analogous to real-time encoding for a typical home-use PC. Each codec was tested for speed three times; the minimum score was then used as the representative time. More detailed information about these measures may be found on the Internet at the Quality Measure page. This version contains only Y-SSIM results only for Normal preset. The Normal preset results for each sequence are presented in next figures. The results do not depend strongly on the metric used. SSIM metric: The leader is x264; MainConcept placed second, and DivX H.264 placed third. For the "Ice Age" and "Up" sequences, the MediaSDK and Elecard encoders exhibited similar results. For the "Indiana Jones" and "State Enemy" sequences, the XviD encoder placed fourth. Absolute speed results are presented in next figures. All the encoders except Microsoft Expression and Theora have a similar growth rate for encoding time versus increasing bitrate. Elecard is the fastest encoder. The encoding speed of the Microsoft Expression and Theora encoders exhibits almost no dependency on bitrate, and Microsoft Expression’s encoding speed decreases at 1,200 kbps for the “Ice Age” sequence. XviD’s encoding speed exhibits little dependency on bitrate for the “Up” sequence. Detailed descriptions of the speed/quality trade-off graphs can be found in Appendix 7. Sometimes, codec results are not present in the particular graph owing to the codec’s extremely poor performance. The codec’s RD curve has no intersection with the reference’s RD curve. The speed/quality trade-off graphs simultaneously show relative quality and encoding speed for the encoders tested in this comparison. XviD is the reference codec, for which both quality and speed are normalized to unity for all of the graphs. The terms “better” and “worse” are used to compare codecs in the same manner as in previous portions of this comparison. Please note that the method of averaging among all sequences assumes that all codecs produced results for each sequence. When this is not the case, only existing results are taken into account. Next figures show results for the Normal preset. The results differ depending on the chosen metric. 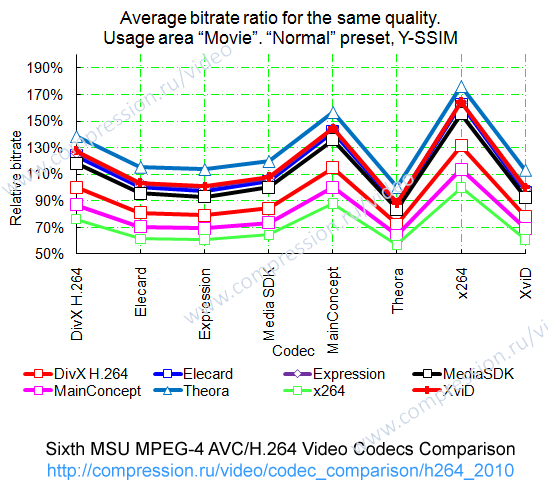 Y-SSIM: The three best codecs (no codec performs faster with higher quality) in terms of speed and quality are XviD, Elecard and x264 on average, except for the "Ice Age" and "Indiana Jones" sequences. The x264 encoder is better on average than DivX H.264 and MainConcept. Almost all encoders except Microsoft Expression exhibited better results on average than did Theora. Encoders with Normal presets, except the Microsoft Expression encoder, demonstrate good bitrate handling for all sequences. For the “Up” sequence, XviD showed less than stellar results, especially at high bitrates. For all sequences, MainConcept, x264, Elecard and DivX H.264 showed the best results compared with other encoders. DivX H.264’s bitrate decreases at 1,500 kbps. MediaSDK slightly decreases bitrates, but the results are stable. Theora has a good bitrate handling mechanism but is not very stable. Next table shows relative bitrates for a fixed-quality output for all codecs. Note that these tables do not include information about the speed of the encoder. Note that each number in the tables below corresponds to some range of bitrates (see Appendix 7 for more details). Unfortunately, these ranges can differ significantly because of differences in the quality of compared encoders. This situation can lead to some inadequate results when three or more codecs are compared. This comparison technique will be improved in the future. The leaders are x264 and MainConcept, depending on the quality metric (the bitrate difference is 18% for a fixed quality). Next figure depicts the data from the table above. Each line in the figures corresponds to one codec. Values on the vertical axis are the average relative bitrates compared with the codecs along the horizontal axis. A lower bitrate indicates better relative results. The leading encoders in this usage area are MainConcept and x264. The quality of the Theora encoder is rather low. The leaders in the HDTV area are x264, DivX H.264 and MainConcept. The XviD encoder trails all other H.264 encoders. Theora demonstrates rather poor results compared with other encoders. 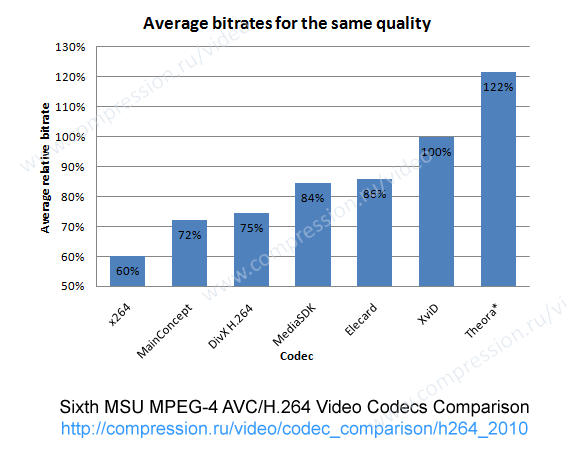 Overall, the leader in this comparison is x264, followed by MainConcept and DivX H.264. The Theora encoder demonstrates the worst results among all codecs tested. *The encoding speed of this codec does not fall in the required range owing to our chosen presets or to a lack of options. Microsoft Expression Encoder 3 could not be placed in this list because of its much longer encoding time compared with other encoders (except Theora). Using the standard Theora interface, we could not find any multithreading options; Theora works only in single-thread mode. The leader in this comparison is x264—its quality difference (according to the SSIM metric) could be explained by the special encoding option ("--tune ssim"). Interestingly, using the PSNR metric for MainConcept yielded results comparable with or better than those of x264. This means that no encoder can achieve the best results for both SSIM and PSNR when using the same parameters. The difference between the MainConcept and DivX H.264 encoders is not overly significant, so these encoders tied for second in this comparison. The developers of the Elecard encoder do not provide a High Speed preset, so its ranking is based solely on the results for the Normal and High Quality presets. The dicas encoder holds third or fourth place for some sequences. DivX H.264 – quite balanced encoder with not very big number of parameters, this fact could be comfortable for users. This encoder is designed as a free sample application for DivX Plus HD compliant video encoding, and is a feature-constrained, for-purpose application. Elecard - very fast codec with good encoding quality and very flexible settings. Many adjustable encoding settings are provided. This encoder has a very good bitrate handling mechanism (especially for the “Movies” usage area). Microsoft Expression Encoder – the low encoding speed could result from the GUI loading every time a video is encoded. Unfortunately, we could not automate the encoder to eliminate this GUI loading. MediaSDK – balanced encoder with a limited number of parameters but several use cases (speed/quality presets), making the encoder very comfortable for users. MainConcept – one of the best codecs by encoding quality; has many encoding settings that can be adjusted. This encoder has a very good bitrate handling mechanism. Theora – not an H.264 codec. Using our testing methodology (objective metrics) and test set, this encoder yields lower quality than do H.264 codecs and even MPEG-4 ASP. x264 – one of the best codecs by encoding quality; has very user-friendly predefined presets, as well as many adjustable encoding settings. 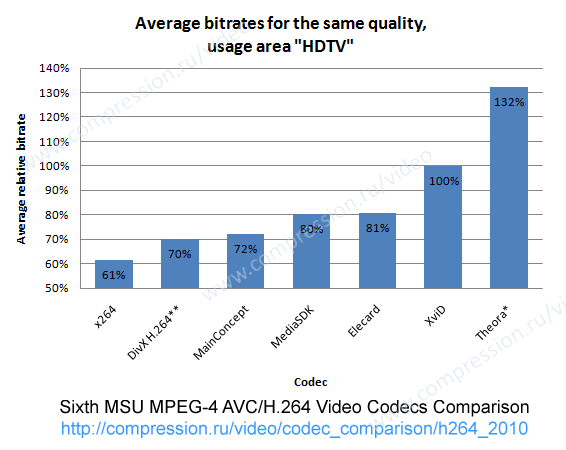 XviD – an MPEG-4 ASP codec; its quality could be very close to or even higher than that of some commercial H.264 standard implementations, especially for encoding “Movie” sequences, but not for “HDTV” sequences. 8 years working in the area of video codec analysis and tuning using objective quality metrics and subjective comparisons. 16 reports of video codec comparisons and analysis (H.264, MPEG-4 MPEG-2, decoders’ error recovery).